The doctor will begin by taking a thorough history and completing an evaluation of your spine. Once it is determined you are a good candidate for chiropractic care, your Schertz Chiropractic will provide a safe, precision adjustment to relieve pressure in joints and nerves in the areas where spinal bones are found to be stuck or misaligned (aka…subluxated). An adjustment is a light to moderate force (by hand or with an adjusting tool) into spinal bones that have lost their proper motion or alignment. Other areas such as shoulder joints, ankles and elbows can also be adjusted if needed. Want to save a few bucks? Bring in the ‘Introductory Special’ certificate below. It’s a good idea to call first. To help maintain flow we only accept a limited number of New Patients per day. If you do stop by, please stop by within 1 hour of closing for morning and afternoon hours to ensure there is enough time to be seen. Now get ready for a whole new approach to improving your sleep, pain, energy and health! Whether you are trying to beat your personal best or just go grocery shopping comfortably, chiropractic can help. At Express Chiropractic Schertz we believe everyone should have access to convenient and affordable chiropractic wellness care. Studies show that show that chiropractic care has benefits for not only feeling better but staying well and preventing future problems. While at the beginning of care you may need more frequent care, an occasional ‘pain free’ checkup is also important to help maintain better spine health and nerve flow. 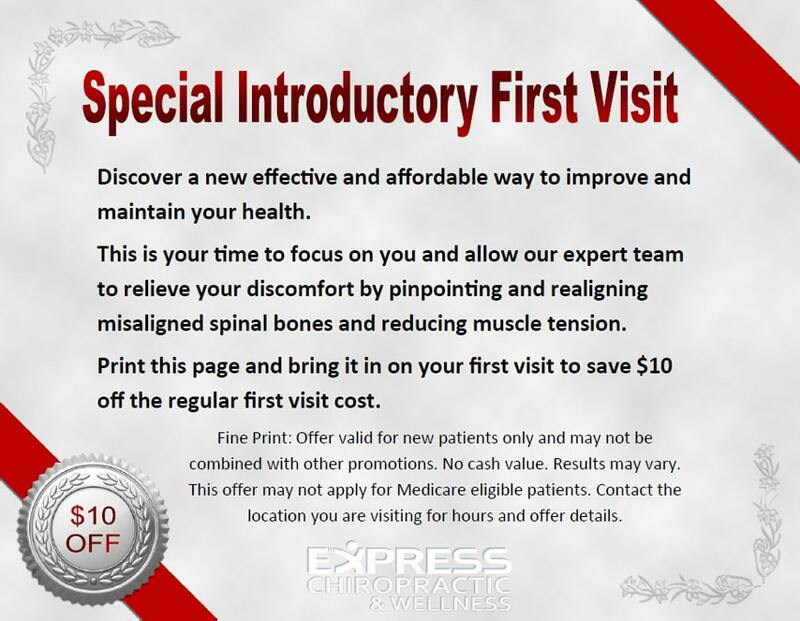 At Express, we believe the decision on how much care you need should be between you and your Schertz Chiropractor rather than dictated by an insurance company or other 3rd party payer. Depending factors such as age, your job, old injuries and overall health, maintaining a healthy spine is often times a long-term investment…not a short-term expense. Old injuries stemming from sports, slips and falls and even auto accidents can cause a spine to become subluxated or misaligned. But even putting past trauma aside, there is still plenty you do on a daily basis that puts wear and tear on your body. From sleep and work postures to working out and even commuting in your care, the associated stress can cause spinal bones to lose their proper alignment. – Myofascial Release: A localized massage to the affected muscles designed to lengthen and ‘release’ tight muscles. – Trigger Point Therapy: Pressure – typically static or with slight motion – on the area of tight muscle or ‘knot’ to stimulate the muscle spasm to release. – PNF Stretching: Proprioceptive Neuromuscular Facilitation (PNF) stretching is an effective stretching technique that can relieve tension in muscles that support the neck and back to muscles in the arms and legs. MRT is a very quick and effective stand alone service and also a great compliment to the chiropractic adjustment. What Services does Express Chiropractic offer? Express Chiropractic & Wellness keeps the care simpel providing only chiropractic and massage care. The only condition we diagnose and treat is Vertebral Subluxation Complex (improper spinal bone alignment and motion and the associated muscle tension, joint inflammation, and nerve interference). Restoring proper motion and alignment is achieved through what is commonly called an Adjustment. Massage services become important in correcting subluxations because more often than not, a misaligned spinal bones will lead to increased muscle tension called Spasm. Your Schertz massage therapist is trained to pinpoint and relieve the muscle spasm using Muscle Relief Therapy or MRT. While an adjustment is considered to be safe, as evidenced by a New Zealand government study and others, you should notify your chiropractor of any pre-existing disease or illness such as strokes, rheumatoid arthritis or unstable joints so treatment that may affect these issues can be avoided or modified. An adjustment is a light to moderate force by hand or with an instrument into spinal joint that needs it. And while most people think of an adjustment of the spine, they are equally effective in other areas of the body such as ankles, wrists and elbows. As insurance deductibles and copayments continue to climb, at Express Chiropractic Schertz we have eliminated the need for using insurance by setting our prices below that of most copayments.